So, you think Tiger Woods should start talking? June 13th, 1966 The United States States Supreme Court decided that you & I didn't have to talk to police. Furthermore, having watched 1,785,031 movies based on 'The Mob,' I know not to talk to police! So is it that crazy that Tiger Woods came to the same conclusion upon Florida Highway Patrol showing up on his front steps? To all of you who believe he should talk to police, the media, the "fans", and or anyone else, not happening! To Charles Barkley, you giving advice to Tiger Woods is on the same level as me giving advice to the President. To TMZ, isn't their a celebutante taking off her bra you should be following? Bottom Line: There is only one group of people, aside from his wife, that Tiger should be forced to speak to, sponsors. If I'm Nike, Gatorade, or any of the other countless businesses which Tiger endorses, I want to know before I read about it. I can't ask housewives to buy my son new Tiger Gear without knowing what they'll find out about eventually. As for 'the public', move along because Tiger Woods isn't talking and we have zero right to know about any of it. Florida State, your dead to me! To treat Bobby Bowden like that, it's disgraceful! Put it this way: Your father? Well let's face it, he's slipped a tad over the last ten years. He got older and his best years of parenting are behind him. At what point do you get to ask him to step down and allow someone else to do it better? You don't! Neither, does Florida State! Bobby Bowden is to Florida State what your father is to you! The second winningest coach of all time was for all intents and purposes forced out at the program he made. Before Randy Shannon, Jimmy Johnson was 'The U', before Urban Meyer, Steve Spurrier was Florida. However, in Tallahassee only one man is Florida State and that man is Bobby Bowden! 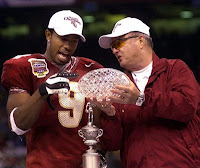 Who cares if you have to wait a couple years while Bowden finishes what he's started? A 2x National Champion who also brought not one but two Heisman Trophy winners back to the university has had some bad years as of late, still not missed a bowl game in 27 years. He's won countless ACC titles, countless big games, and brought a university to national prominance that it had never experienced before him. Boo hoo! You don't treat people like Bobby Bowden like that. Jimbo Fisher has to wait to take the reigns? So what!?!? I disagree with removing Bowden, but my real problem here is that they made him do it like that! It wasn't his choice, FSU did that! Bottom Line: The field is named after him, his statue stands outside the stadium, let the man go out on his own terms and be greatful for it! For everyone who believes either Indy or 'Nawlins would benefit from losing a game, stop it! How would a team benefit from losing? To see how they bounce back? To take pressure off them? Give me a break! Both Indianapolis and New Orleans have been behind in games late, both teams have come back and won. They know what its like to put the rest of the game in front of them and storm back. Look, there is five games remaining for each of these two teams and they need to win every single one of them, that's the idea from day one. Just because you've won your first 11, your gameplan doesn't change, you don't decide that now it'd be a good time to lose a game. Any former or current Patriot who played on a team that most recently completed an undefeated regular season may tell you it was a little stressful or that after a while the questions became alot to handle, but none of them would have rathered lose a game. The Saints, they have to win out because the Vikings are hot on their heels and both teams benefit from playing at home that's a fact. The Colts, they are a veteran team with Super Bowl experience, it doesn't matter to them if they lose a game, they play every game as if it were their last. Bottom Line: Your goal from game one is the same as game 19, W-I-N!